Are you concerned about ugly and unsightly toenails? Well we have a solution for you at Foot Healthcare Associates. Our practice is the first in Michigan to be able to offer the Lunula Laser for fungal toenails. This new and exciting treatment is a proven non invasive treatment for onychomycosis (fungal nails). There is no discomfort, downtime or side effects associated with the laser. 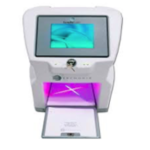 It uses low-level laser light to treat fungus and usually requires four 12-minute sessions to the affected area. The Lunula Laser has gone through extensive research which has been published in reputable medical journals. In an 18-month study of 323 patients, 99% of patients reported full clearance of their fungal infections after four treatments. In another study that evaluated 168 toes which had fungal involvement of 81.15% of the nail, it was revealed that the disease was reduced to only 31.32% within the nail after one treatment. At the end of the study, 63.58% of the nail plate had no fungus remaining in it. An additional study, which was FDA directed, evaluated 105 toes and reported an average clear nail of 73.79% and 79.75% at post-procedure months 3 and 6, respectively. Also there was not a single adverse event. Onychomycosis affects at least 10% of the world’s adult population. It is difficult to treat and has a high rate of reinfection. At Foot Healthcare Associates we strive to cure fungal toenails and significantly reduce reinfection with additional supportive measures to enhance your results. If you have any questions please contact one of our offices, located in Southfield, Novi, and Livonia, MI at 248-258-0001. We offer the newest diagnostic and treatment technologies for all your foot and ankle conditions. Robert Sullivan1 and Deirdre O’Flynn. Erchonia Laser Therapy in the Treatment of Onychomycosis. Podiatry Review. Vol. 71(2):6-9. Scher RK, Tavakkol A, Sigurgeirsson B, et al. Onychomycosis: diagnosis and definition of cure. Journal of American Academy of Dermatology. 2007;56:939-944.